I love the holidays. What an awesome opportunity it presents to get our large family together. One Thanksgiving a few years back, we were especially blessed to be in full force with all twenty-nine of us. The two military boys and eight college students had graced us with their presence. Additionally, several of the teens were bringing girlfriends and boyfriends for the family to preview. I can’t to imagine what it must be like having a gander at our brood for the first time. There are so many names, faces, and personalities. It is always a risk exposing unsuspecting new relationships to quirky relatives too soon. I am guessing that there must be some peculiar compulsion that drives the young to show off their companions in seeking approval from the herd. Our little group is a varied and bizarre collection from the friendly to eccentric. We live in a delicate, harmonic balance forged from years of patience, love, forgiveness and a well establish pecking order. After giving thanks on this momentous occasion, the pack dispersed and the feeding frenzy began with the children. As the adults sauntered up to the trough, utter dismay gave way to frustration and anger. No fowl was to be found! The children had over-filled their plates and not a morsel of poultry remained. We were left to dine on deli roast beef. I can assure you, there was no joy down in Who-ville that sad, sad day. As the oldest daughter of the clan, I felt it was my duty to evoke a new law, which has held firm (but not unchallenged) to this very day…adults first! As the kids become of age it is an interesting sight watching them preen and strut to the front of the line. It likens somewhat to the animal kingdom with the young bucks locking horns, pushing and shoving as a new pecking order gets established. Sadly, now only one kid remains under eighteen as our herd rapidly ages. Why just this past year a clever thinking aunt made a quick amendment to the law screaming out, “parents first” which instantly displaced seventeen starving mongrels. Through trial and error we have learned over the years what menu items are best brought by whom. I was designated Aunt Chocky (short for chocolate), by my youngest niece many years ago. I tend to bring desserts because I find great joy in creating chocolate creations. Conversely, my middle sister has come to be known as Aunt Veggie. One year she quipped, “no one likes Aunt Veggie’s food, ” to which I replied, “maybe not now, but when their arteries are hardening they’ll be cursing me and praising you.” Finally, my youngest sister has mastered the art of Jello, from spirals to shooters. Together with the contributions from grandma and the rest of the family, we offer quite a feast. Another tradition of ours was born out of re-gifting an obnoxious talking cookie jar. My sister was kind enough to give it to my youngest daughter a few years back, and not wanting to hog it all to myself, Ye Old Cookie Jar Tradition began. The giver must always fill the belly with delicious treats before depositing it in some unsuspecting relatives home. Many of us, after hosting a family gathering, have fallen wearily into bed and been startled by “Stop, move away from the cookie jar!” from beneath our pillows. Attached to the cookie jar is a list of past recipients, detailing the delicious contents and in what location the cookie jar was found. Now that’s a gift that just keeps giving. As time marches on, we have come to realize how truly blessed we are. We have had ups and downs like everyone else, made mistakes, and found something to love in each other. The women and men of our family have tried to be remarkable witnesses for our daughters and sons alike. We are a testament to the genius of God’s design for humanity to unite in a bond of love modeling family for the next generation. Mary, Mother of God pray for us all. 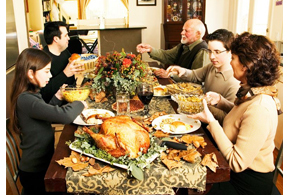 Previous ArticleIs Thanksgiving a Time to Evangelize?